This larger sculpture is beginning to take shape as I cut out the forms on the first face. I am using the sanding and polishing sandpaper at this stage in order to avoid turning the sculpture too many times. 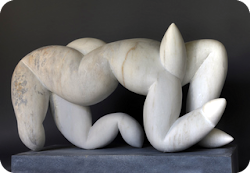 Turning a sculpture this heavy and delicate will be tricky and run the risk of damaging it. I will probably have to make a special frame in order to transport this piece safely. It will be fine once it is standing, the risk is in the moving. I am on a bigger version now with the diminishing column wobbling upwards from both side to side and front to back. I toyed with the idea of round forms like mushrooms, or almond shapes but am a little nervous of losing too much strength when working on this larger scale. This carving is quite large at about seven feet. I am not sure this one will fit in the gallery… I am enjoying these forms built of units however and will continue whilst there is room to explore the idea further. I have spent the day working over the surface of the carving with sandpapers. I start with a really rough ‘Tarmac’ grade which removes lots of material enabling one to make small alterations to the forms. Once I have worked the whole surface over with this I progress through ever finer papers. Each step up in grade removes less material but improves the quality of the finish. I did not quite have time to stand it up today. Moving this sculpture is going to be tricky as there are lots of delicate points everywhere. I might have to build a special frame to transport it. This piece is coming on well and I am looking forward to standing it up. It has been several days since my last post as I have been attending an exhibition Out of Nature in Herefordshire. All sorts of sculpture on display in the gardens of the magnificent Newport house. I was asked to give a talk about my working practices. I followed Satish Kumar in talking as he opened the exhibition; always a hard act to follow. He speaks brilliantly! Mine was ok although there is certainly room to improve, I find that standing in front of lots of people makes me a little nervous and as a consequence muddle all that I want to say. Carving this new piece is easier for me than public speaking. I must consider what kind of base to put it on. I liked the last piece with the square mushrooms wobbling upwards, so I am trying a new version. The top forms will be twisted 45% from the bottom. I am taking a good deal of trouble to get the shape of the sculpture as I want it before getting involved with the individual forms. I am of course itching to reveal those forms and have to hold myself back to some extent. The Matbro is back and working thanks to my wonderful neighbour Rich. I was alarmed however to find that it was not where I parked it last night. The handbrake obviously needs some further adjustment as the machine had rolled out of the shed in the night. Luckily the wheels were not aligned and it turned away from the huge hole that I have dug for the compost. Had the wheels been turned the other way, it would have rolled straight in!